Crawfish Festival is Almost Here! I know the official first day of spring this year was March 20th, but for me, what really marks springtime in Memphis is the Crawfish Festival! As the first real event of Spring, this annual event consumes almost an entire ton of crawfish, welcomes close to 16,000 visitors, provides shopping from over 60 vendors, offers kids activities and more, making this one of the favorite events of local Memphians (especially midtowners). Each year, people from all over the region descend on Overton Square to eat, drink, and be merry while supporting a non-profit charity, which receives the majority of the event’s receipts. This year’s event is particularly exciting because this year’s Crawfish Festival benefits A Betor Way. Not only does this raise needed funds for the group, but more importantly, raises awareness of the groups mission, to provide assistance and resources to addicts and those affected by addiction, while eliminating barriers to anyone seeking help with addiction. In addition to benefiting financially from this year’s festival, A Betor Way has also volunteered their time and resources to organize, support, and manage this year’s Crawfish Festival. This establishes a great partnership that not only allows the community to invest in A Betor Way, but also provides a path for A Betor Way to give back to the community they so deeply love and want to protect. 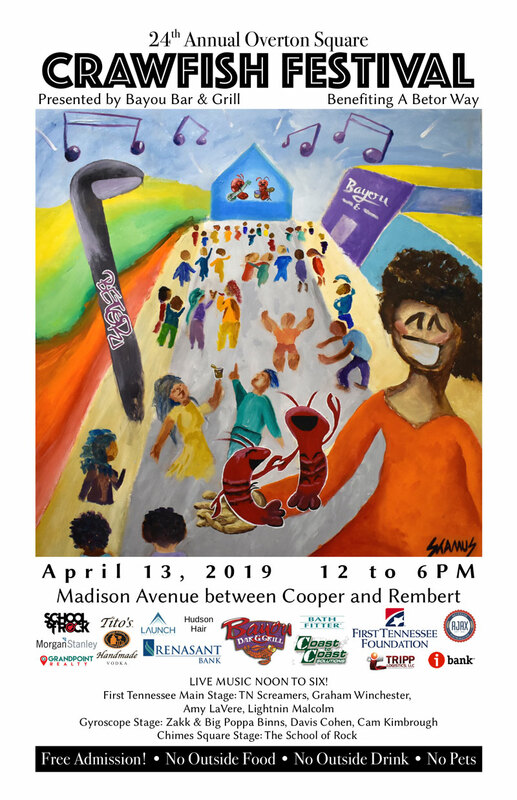 So mark April 13th on your calendars and head down to Overton Square to enjoy some mud bugs, live music, and share in all the fun that happens every spring.